Back in early September I got the opportunity to second shoot a wedding for Cody & Allison in Joshua Tree (which was INSANELY gorgeous); but that trip somehow turned into staying with a bunch of other creatives in an AirBnb in Joshua Tree for a week. It was the most fun I think I have ever had and it was also the most out of my element. I was in a house with so many people that I view as photog-famous (Cody Harris, Kyle Wilson, Jacob Loafman, Becca Neblock, Maggie Grace, Jenna Mahr, and Nicole Seligman to name a few) and yet somehow I found myself waking up in the coolest house, with the coolest people, in the coolest (aka hottest) place. Still blows my mind, and I'm still not sure how I ended up there, although I know it wasn't a dream because I have the pictures and selfies to prove it ;) but I will sit quietly and be thankful that it happened. This was just one of the many shoots we got to do. This was a shoot set-up by Kyle Wilson, featuring the insanely GORGEOUS Rachael Bernstein who is also a photographer. 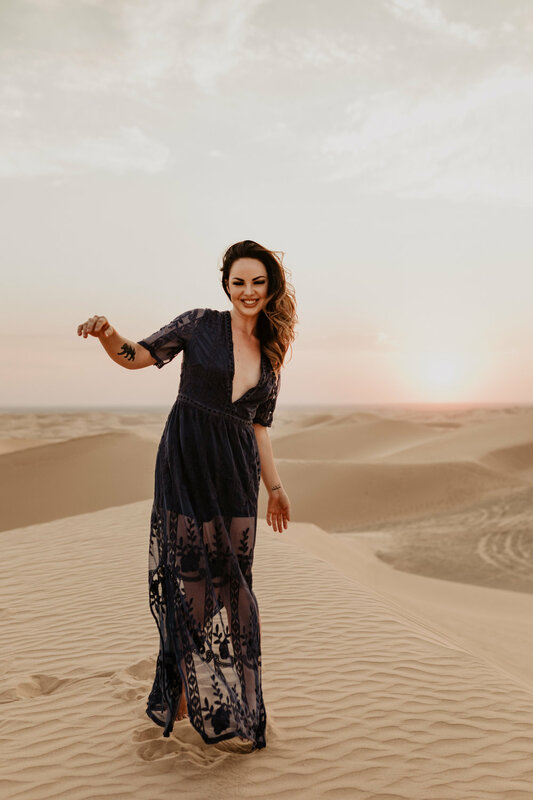 We showed up to the Glamis Sand Dunes with literally 8 minutes of sunlight to spare (after 2 and a half hours of driving.... anything to get the shot amiright) so it was a little bit of a mad dash to get these shots but HOLY MOSES did she rock them. I am convinced that Rachael is a real life goddess, and I don't think you'll be able to convince me otherwise. 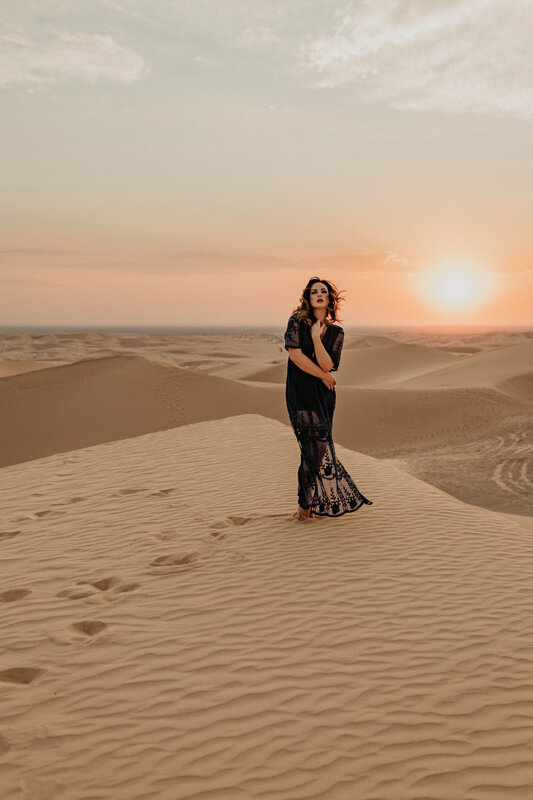 This shoot represents more than just a beautiful model in a beautiful location to me... It represents finding your self worth when all that you feel is self doubt. The last 2 years of my personal life have been HARD. I've faced the deepest depths of depression, anxiety, and self loathing. I've found myself unable to move, emotions frozen. I've found myself crying/sobbing for hours on end and when asked, "why?" I didn't have an audible answer. People have asked me how that's possible when online I look like my life is put together and I'm living the dream life traveling the world and photographing the best this world has to offer. It's hard to describe to anyone who hasn't experienced depression and anxiety. But the best answer I can give you is that photography is more than a hobby. It's more than just my job. It gives me confidence when I have none left. It gives me a purpose. How lucky am I that I have a JOB that doubles as therapy. That feeds my heart and brings me joy because what I do MEANS something to my clients. I have the means to provide memories for brides and grooms for years to come. I have the means to give something tangible for people to hold onto once they've lost a child, a parent, a sister, a friend, an animal. What I do isn't just a hobby. What I do is IMPORTANT. And giving that gift to someone is what keeps me going. So when Rachael wrote back to me that she was on the verge of tears because she too has faced a hard year and getting these photos back gave her back a little bit of confidence and made her feel beautiful for the first time in months, I wanted to just hug her. Because I get it. And I am so thankful to be able to give someone that feeling of self worth. Because she deserves it. YOU deserve it.